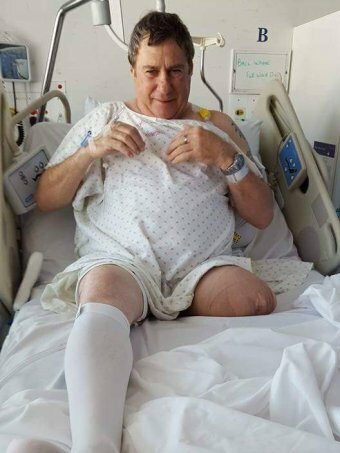 A Tasmanian man is alleging he needed to have his leg amputated after a botched knee operation and is suing a medical specialist and his regional hospital. Wayne Ball has launched a claim for unspecified damages for medical negligence against orthopaedic surgeon Dr Richard HOCKING and the North West Regional Hospital in Burnie following a left knee replacement in 2014. The 61-year-old from Ulverstone alleges in a writ filed in the Burnie Supreme Court yesterday that the operation was unsuccessful because Dr Hocking, who was employed as a locum, did not have the necessary skill and care to perform the procedure. After the operation, Mr Ball claims his leg became infected and there was instability and other complications with his knee that were not adequately treated. He says two years later he was forced to have his leg amputated. Mr Ball alleges he was not told about Dr Hocking’s professional history, which includes being suspended by the Medical Board of Australia, a decision that was later overturned. Dr Hocking is now working for Bundaberg Hospital in Queensland and has no current medical restrictions limiting his practice. MEAG COMMENT: That says it all! Queenslanders, beware.